Just because you want to give your top clients and employees a nice gift pen this year does not mean you have to spend a lot of money. Cross Roller Ball Pens, one of the most trusted and loved pen manufacturers in the world offers a massive selection of good quality gift pens that you may find of interest. Cross Ball Pens are very good quality pens that will be appreciated by anyone receiving them? Now, the Cross ball pens are available as an attractive gift pen set! Cross is well known for its classically styled pens and these pen sets are no exception. The gift box really looks the part. It is felt lined with recesses for the two pens. The felt is also stamped with the Cross logo. The Cross Roller Ball Pens modern styling and fashionable colors make it the professional's choice in the business world. Its bold, contoured, seamless design with innovative rounded clip makes it a timeless beauty. 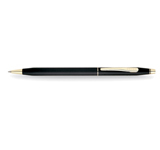 The Cross Roller Ball Pen is free flowing like todays modern lifestyle. There are no boundaries when your clients and employees receive this gift. The feeling of allegiance and appreciation will carry on for years to come. It is their high quality that is, in our opinion the symbol of the excellent reputation of the Cross name. It is worth noting that having written extensively with the Cross ballpoint pen. They have a very smooth writing quality. You can get these cross pens customized with your logo imprinted on them. That will have a long lasting impression in the minds of the receiver. So what are you waiting for? Order Cross Gift Pen Set and get that next successful promotion underway.